For some time now an idea has been percolating up in my gray matter and now I’m ready, at last, to spill the beans and hear what you think. You already know that I love making pies and teaching others how to do it, and that’s not about to change any time soon. We’ll continue to grow and nurture The Pie Academy, add lots of new recipes and other content and, with a little luck, find a legion of new fans. But I’ve had a serious desire for a couple of years now to branch out and share my passion for all things culinary with you and to find an even wider audience for my brand of wholesome home cooking. Perhaps you think of me primarily as a pie maker or baking authority, and indeed I have written extensively in those areas. But I’ve also written hundreds of magazine articles and sixteen cookbooks as a food writer, and much of it has nothing to do with pies or baking. In other words, I have more to say as a cook than fits neatly under The Pie Academy banner, and I’m anxious to share it with you. So I’ve decided to launch another website. I’m calling it TheGoodCooksAcademy.com – a sister site to The Pie Academy – a place where I can share my recipes, my kitchen philosophy, and thoughts and opinions on subjects from cooking tools to the latest food trends, and everything in between. I recognize that many of us are eating healthier these days – I certainly am since my heart attack last summer – so wholesome cooking will be a common theme at The Good Cooks Academy. I’m a stickler for food waste and an unrepentant frugal Yankee, too, so you can expect to find me writing about clever ways to use up leftovers and stretch your food dollar. Not to mention the occasional cranky essay about people who mindlessly toss groceries into their shopping cart and other things that get my goat. Instructional videos and a variety of cooking courses will be a prominent feature of the new site. Let’s face it: no matter how accomplished we are, we all have gaps in our cooking knowledge or want to pick up new kitchen skills and techniques. The Good Cooks Academy will stress cooking fundamentals and help you become a more well-rounded and confident cook, whether you’re a novice in the kitchen or a seasoned pro. My goal is to do all this and more, to build a large community of kindred cooks, and to have some good fun in the process. Now here’s the important part: I can’t do any of this without you, my friend. I need you and everyone you know to sign up for The Good Cooks Academy. Just so we’re clear, the site isn’t up and running yet; I’m working on it as we speak. But there is a sign up page here. All I need is your first name and email address. 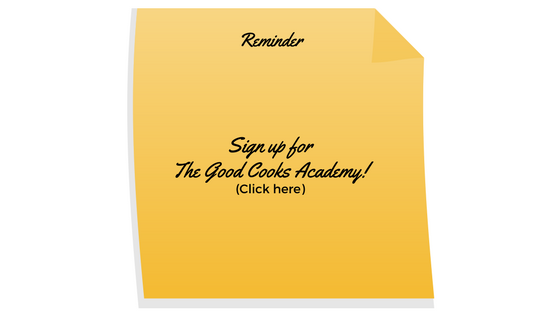 Once you sign up you’ll get an email with a link to confirm your subscription to The Good Cooks Academy. After that, until the site goes live, you’ll occasionally hear from me with updates. Thanks so much, in advance, for joining me in this new adventure. I can’t tell you how excited I am about The Good Cooks Academy, even if I’m feeling pretty daunted by the amount of work it takes to get something like this off the ground. But with your support I know it will be worth it. P.S. – I’m anxious to learn more about you, the things you like to cook, your challenges in the kitchen, and what you’d like to learn about at The Good Cooks Academy. So after you sign up I’ll be in touch with some questions and I hope you’ll get back to me.